Solve the puzzle or even be the puzzle! 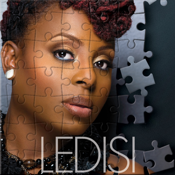 It’s your choice in this app celebrating Ledisi’s new album Pieces of Me. Put together an image of the star artist or snap a picture to create your own puzzle. And see if you can pull off the trademark Ledisi Mohawk with the LedHead Yourself feature. The app also includes the hottest Ledisi news, photos, tracks and videos.